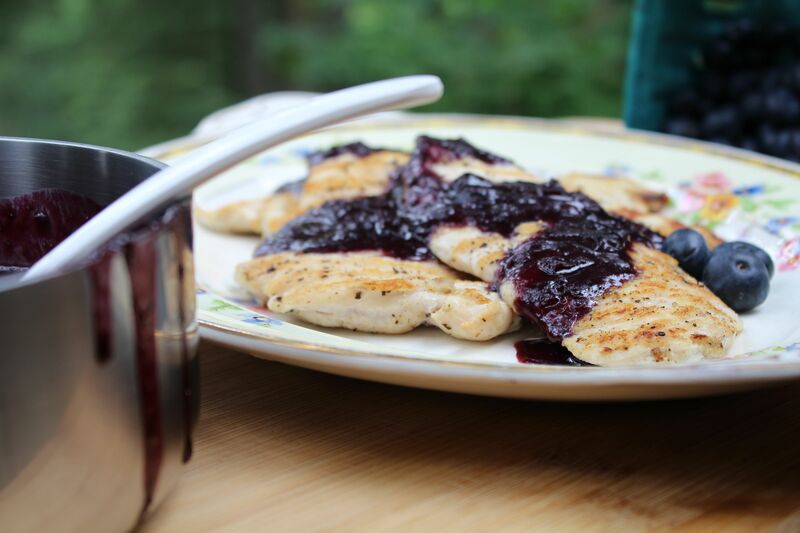 Spicy and sweet blueberry barbeque sauce over grilled chicken. This sauce is awesomely delicious and oh-so-simple to make with your choice of fresh berries. Here, I use the bounty of fresh Oregon blueberries but blackberries, raspberries, marionberries and others work well, too. You can adjust the heat by adding more pepper if you want to spice it up. Great on grilled chicken, pork chops, ribs and shrimp! Enjoy. 1. Cook Onion & Pepper: In a medium saucepan, heat oil until shimmering. Add onion and pepper and sauce until soft, about 3 minutes. 2. Simmer Sauce: Add blueberries, balsamic vinegar, brown sugar, Dijon mustard, molasses, Worcestershire sauce, garlic powder, salt and cayenne pepper to pan and bring to a boil. Simmer 5 minutes, stirring often. 4. Finish and Serve: Return blended sauce to pan. Add lemon juice and bring just to a boil. Remove from heat and let cool slightly before using. Enjoy!